Magica® Rust Remover Spray removes rust from just about any surface including fabric, carpet, upholstery, fiberglass and much more. Simply spray to the rust stain and watch it disappear. 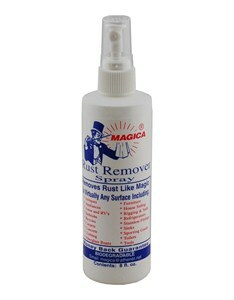 Shake the bottle and spray the Magica directly on the rust stain. No rubbing or scrubbing is needed. Rinse with water when you’re done. 8 oz. spray bottle.